PRAYER PROMPT ••• When someone tells you they pray for you, how does it make you feel? There’s any number of ways people may act when they hear they are being prayed for, but whether appreciative or angry – offering prayer for someone else is the greatest gift we can give them. Wouldn’t that warm your heart to read those words? Especially from a prayer warrior like Paul?!?! For those in the Christian community, we don’t always wait, but we freely ask others for prayers. The request may come from a place of hopeful anticipation or brokenness and discouragement, but either way – asking for prayers is a beautiful gift too! Because you’re encouraging another person to spend time with the Father! Monday’s have such a bad reputation, so why not brighten the start of someone’s week? Send them a text or give them a call to let them know you’re praying for them today. There doesn’t have to be a specifically known reason to pray for another person… borrow the words of Paul and simply thank God for them! Today, as you pray, think about the people you know – close friends, colleagues, and casual acquaintances. Ask the Holy Spirit to direct your prayers and thank Him for the people in your life. Ask Him to guide you if there’s someone who has more specific needs. Yes! 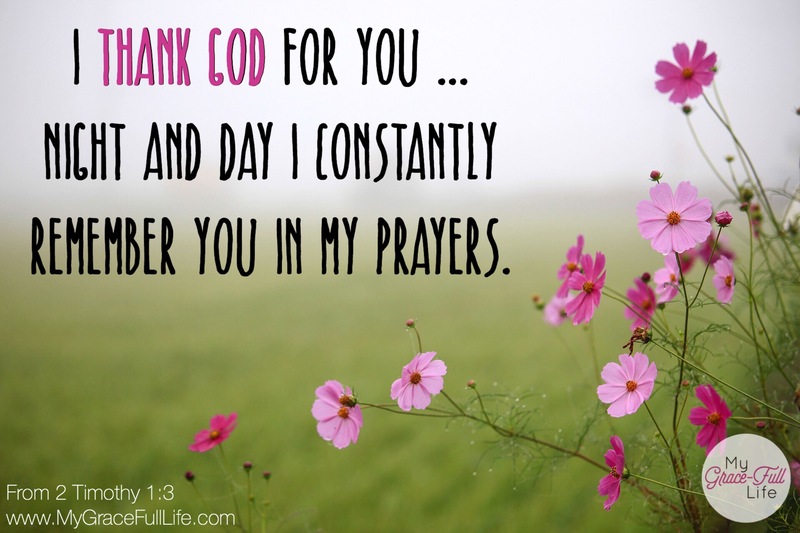 It is such a privilege to pray for others… and it brings me such joy! Thank you for this wonderful encouragement!